FormRoot vegetable with upright foliage. SpacingPlant seeds 1/4 inch deep and 1-2 inches apart, in rows 12 inches apart. FoliageStrong, dark feathery fern-like green foliage grows 10-12 inches tall. FruitBright orange, cylindrical, smooth roots, slightly tapered, with a blunt tip. Roots are 7-8 inches long and 1 1/2 inches in diameter. Nantes-type carrot. Very sweet flavor. Dark green tops are strong, reaching 10-12 inches tall. Soil RequirementsLight, fertile, deep, well-drained, sandy loam soil; pH 5.5-6.8. 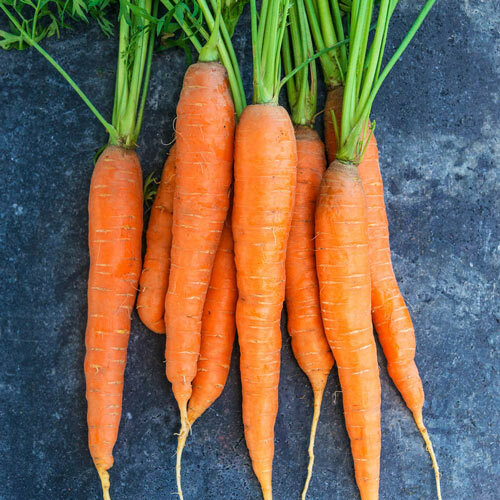 CommentsThe very best overall garden performance in our 2016 carrot trials-attractive, nice sized roots, great flavor, performed even in our clay soil! 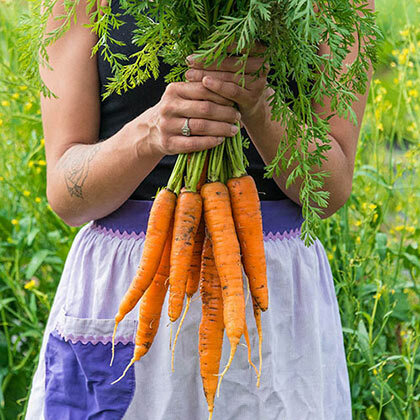 This delightfully super-sweet carrot is one of the very best varieties for over-wintering. Days To Maturity45 days-for baby carrots, 58 days-for full-size carrots.